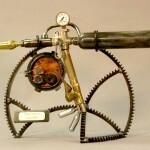 Steam powered weapon designed by Bernard V. Maets, a little known but very prolific inventor of the 19th century. Mr. Maets specialized in a wide variety of weapons and tools using steam as the primary energy source. The Rezal is one a series of prototypes of a weapon with tremendous penetration capability in most materials. What is known about the weapon is limited to information contained in a small notebook found with the Rezal. Test sample #13 was also packed in the same crate along with a small stand. Test sample #13 is a solid steel block one inch thick with several holes blasted clean through. Attempts to fire the weapon since its discovery have failed to produce the results evident in the test sample. The Rezal includes a shoulder belt with four extra steam cartridges. This prototype has an air breather tube found in only about a third of the Maets weapons. Its significance is not understood, but further research in on going. This model was discovered in 2003 in vault in one of Saddam Hussein’s palaces during the Iraq war. How it came to be in Iraq is unknown at this time. Although the Rezal is very powerful it would not be classified as a weapon of mass destruction.